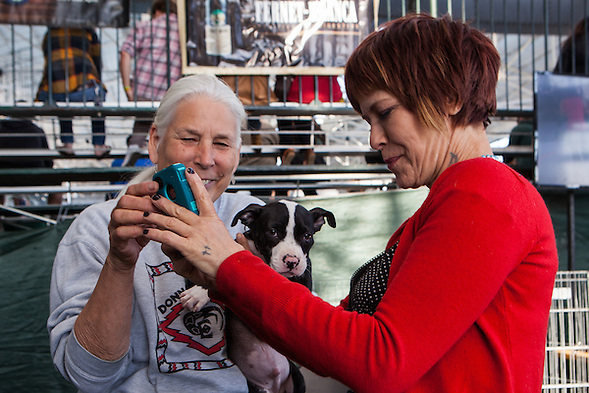 Even the two Rocket Dog Rescue volunteers were “too cute.” This photo might be the best advertisement for animal rescue. Follow your heart. It is often wrong, but when it is right…. 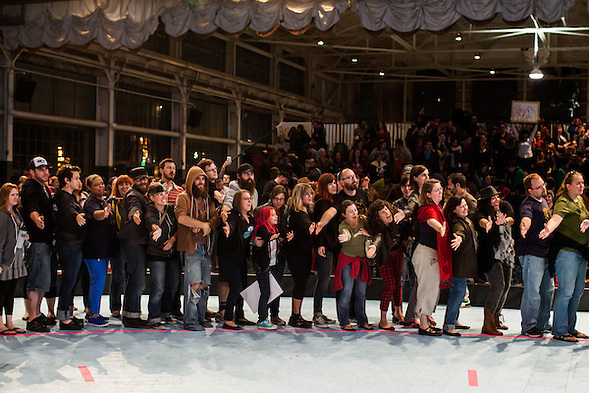 This photo also illustrates what happened to the crowd. We might have become too cute, especially during the first game. 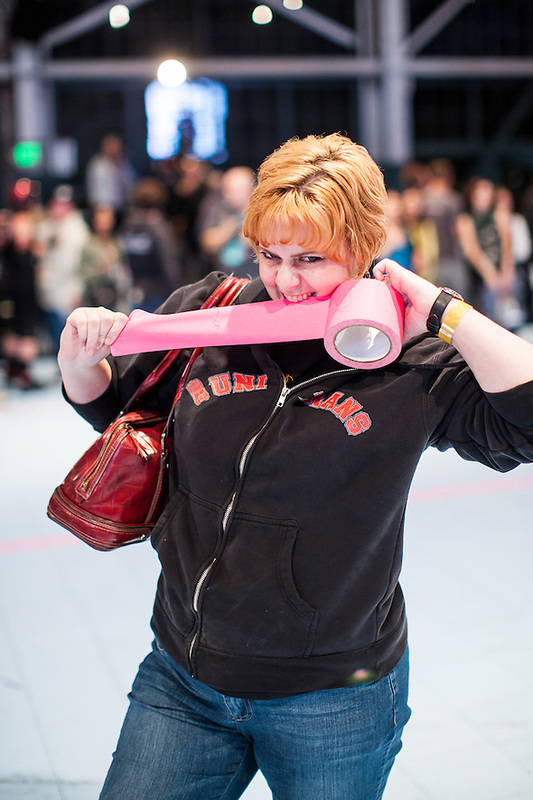 The Bay Area Derby Girls have great fans. I am continually amazed by the support given to the players, photographers, vendors and fans. We just seemed a little more subdued. 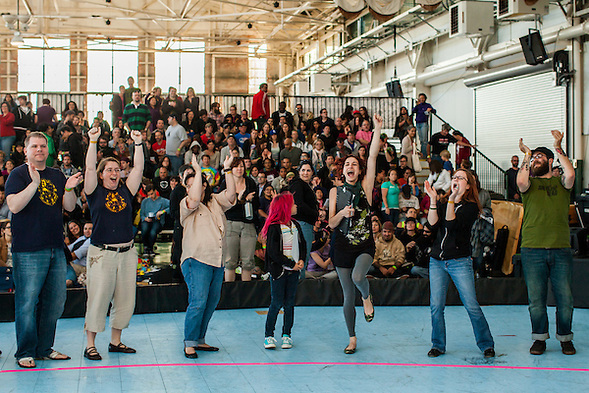 Perhaps we enjoyed returning to Richmond’s Craneway Pavilion and the natural light. When I was not photographing the animals, I often focused on the color and light. 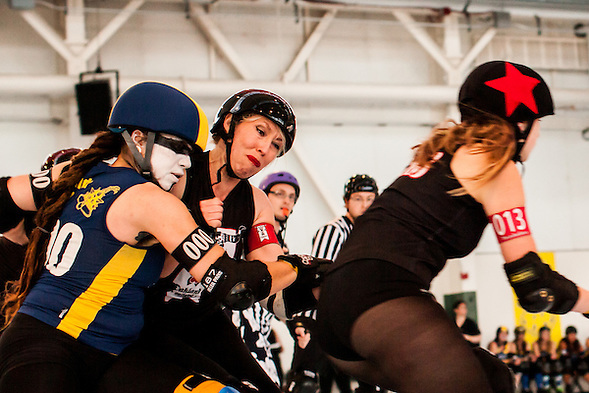 I love this photo of Lulu Lockjaw (the jammer with the star on her helmet) and Y.I. Otter (the official). They are both photogenic in bad light, but this is great light. I could photograph them skating through that light for a long time… and I did. 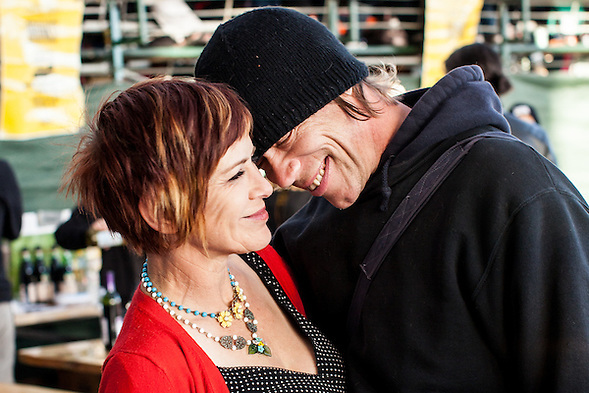 The derby community is more than the skaters. 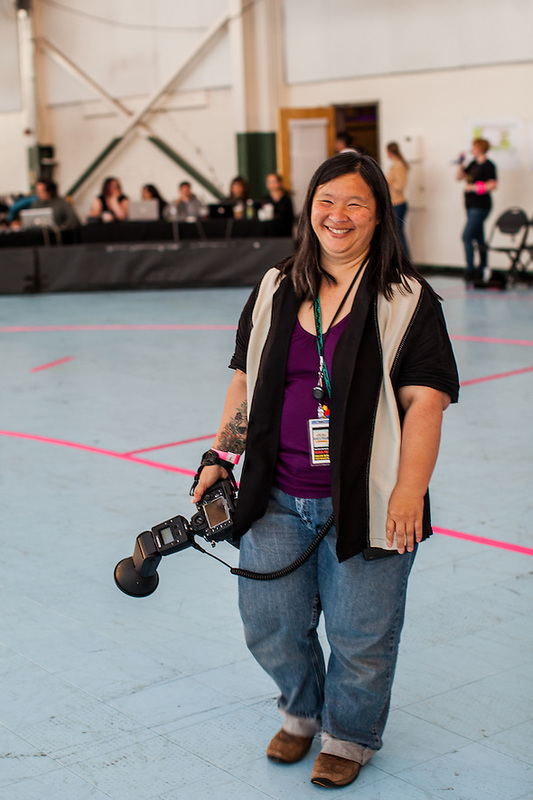 Photographer Donalee is one of my favorite derby people. She is also one of the most popular derby people in the country. I do not know if she has a derby name, but I consider her “The Legend,” though she would choose something much more humble. She is one of the people who is writing the rules of this new era of derby. She amazes me. The night bout between The Oakland Outlaws and The Richmond Wrecking Belles was more difficult to photograph, but I also had opportunities to shoot in different light. The second game also featured the derby player of the month Cat Fever whose long blonde hair was perfect for the night bout. I am learning that derby fans love Demanda Riot, so I am learning to post her photos. It is amazing how much my traffic increases, especially after I post good photos. Hopefully, this is a good one. If not, there are good ones on my photography Facebook site. Derby fans are generous. After I post photos on Facebook, people from at least four continents will view my pictures (and I am a relatively unknown derby photographer.) Derby fans often volunteer for several hours. Fans help promote, because they want to see the sport succeed. Derby fans share generously on Facebook… and after a bout, they usually line the track and congratulate both teams. 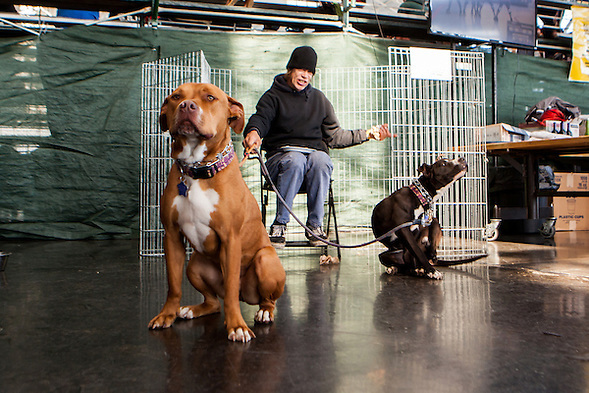 …and more about dogs in prison rehabilitation. Last night (JULY 13) I asked BAD volunteer Havah Tequila if she wanted to see one of my favorite photos from the June doubleheader. I told her I was going to post it on my blog, so here it is. This entry was posted on Friday, June 21st, 2013 at 4:31 pm. 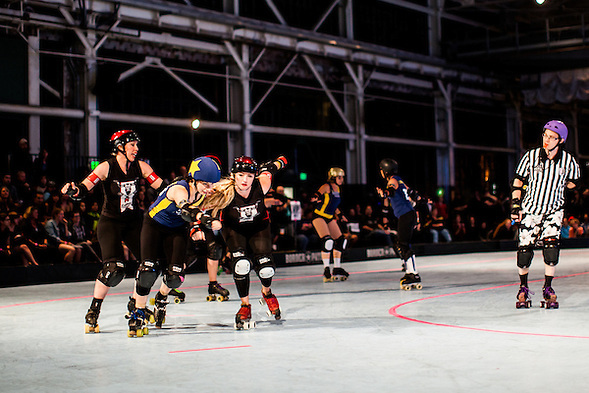 It is filed under Roller Derby and tagged with Berkeley Resistance, Craneway Pavilion, Oakland Outlaws, Richmond Wrecking Belles, Rocket Dog Rescue, San Francisco ShEvil Dead, Women's Flat Track Roller Derby. You can follow any responses to this entry through the RSS 2.0 feed. 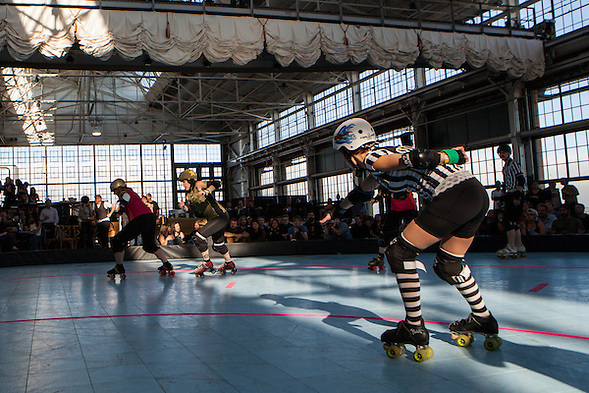 and now for the blog about The Richmond Wrecking Belles, Oakland Outlaws, TheBerkeleyResistance, San Francisco ShEvil Dead, Rocket Dog Rescue and the awesome B.ay A.rea D.erby Girls fans. Donalee Eiri, I added something about you on this post… would like to say more about how much you do for derby.